Are you looking for ways to get the kids to eat more adventurously? Are you looking for simple, delicious recipes the whole family can enjoy? If you are, Little Pip Eats the Colours of the Rainbow by nutritionist Amie Harper is the recipe book you’ve been searching for. Filled with fun and easy (and I mean easy) recipes divided by the colours of the rainbow, this is a recipe book that will get kids loving healthy food without even realising it’s good for them. There’s information about the health benefits of different coloured foods, tips and tricks to accompany the recipes and a wonderful variety of meals for breakfast, lunch, dinner and snacks. And did I say the recipes are easy? With familiar ingredients you likely already have at home (or can easily find) and straightforward instructions with minimal steps, this is a cookbook you will reach for on busy days and evenings when you need food on the table quickly. You’ll find measurements in grams, cups and ounces, so you won’t need to do any measurement conversions, and Harper's beautiful food photography provides an inspiring visual guide for your cooking. All the servings are for one baby/toddler plus a family of four, so everyone can enjoy these colourful meals. And the recipes are delicious. I loved the yellow corn fritters, the pink strawberry scones (with no added sugar) and the orange sweet potato gnocchi. If you’ve got a little one about to start solid foods (or perhaps a reluctant eater), you will love this book. It’s also great for busy families looking for easy ways to get healthy food on the table. Little Pip Eats the Colours of the Rainbow is filled with simple, fun and delicious recipes for the whole family. It’s everything a good cookbook should be. 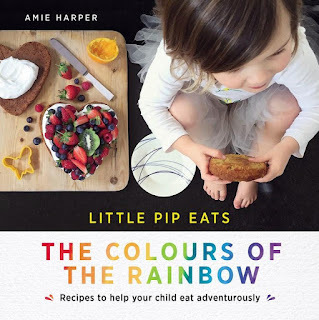 And for another fun recipe book by Amie Harper (this one with recipes for every letter of the alphabet), check out the prequel to Little Pip Eats the Colours of the Rainbow, Baby Pip Eats.